When remodeling your home, it is important that you maintain your attention to detail throughout the project lifecycle. Many tend to put in a large amount of effort into the major changes and end up neglecting the finishing touches that pull it all together. For instance, you may spend many hours selecting the right cabinets for your kitchen, but fail to think through what will best OPERATE in your kitchen. When making these selections, it’s important not to choose form over function; think about both! How do you use your kitchen? Answer this question when considering how best to remodel. In the end, your only limit is your imagination – don’t let it be your budget. When the big projects are done, but you still want something new, refresh your home with these DIY finishing touches that won’t break the bank. Are you always losing your grocery lists? Get a magnetic pad of list paper you can put on your refrigerator, or make your fridge into a chalkboard! It’s an easy, convenient solution to an age-old problem and it looks pretty cool, too! Best of all, it’s easy to erase and decorate whenever and however you like. The kids can have fun with it, too! Check out our photo gallery for more inspiration! Turn drab into fab with this awesome closet hack. 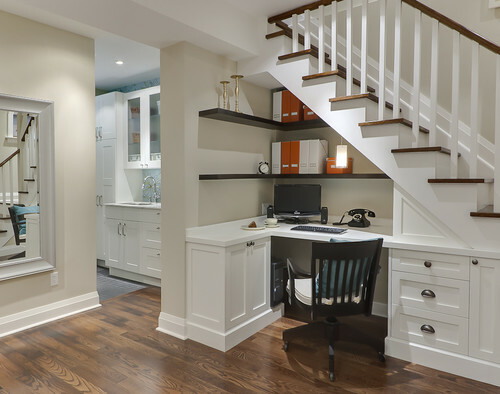 Transform an old, dusty closet into a spectacular mudroom or sitting area. It’s easy to add some hooks to the wall, replace that old lightbulb, and add an ottoman for seating. Even better, try this storage hack: find a storage ottoman for extra storage! You’re on a roll! This isn’t the only way you can transform your home. Try thinking of other areas that need a facelift. What could you do to make those areas more appealing and useful? Ready to Start Your Home Remodeling Project? Call Premier Today! Premier Remodeling is a full-service Houston remodeling company specializing in many different types of home renovations. We pride ourselves on the quality of our craftsmanship and the integrity and expertise of our team. Premier Remodeling is a remodeling contractor devoted to staying informed and up-to-date on the latest construction technology and materials. We continuously strive to improve our knowledge and expertise through our constant pursuit of learning and membership in various prestigious organizations such as the Greater Houston Builders Association (GHBA), the Texas Association of Builders (TAB), and the National Association of Home Builders-Remodelers (NAHB-R). Our Houston-based remodeling company is a remodeling contractor you can trust.